Convincing your toddler to brush their teeth in order to maintain their dental health is no easy feat. Oftentimes, explaining the importance of good dental habits goes in one ear and out the other. However, there are things that you can try to entice your toddler and get them more excited about brushing their teeth. The key here is to make brushing their teeth a fun activity, one that they will potentially look forward to every night. 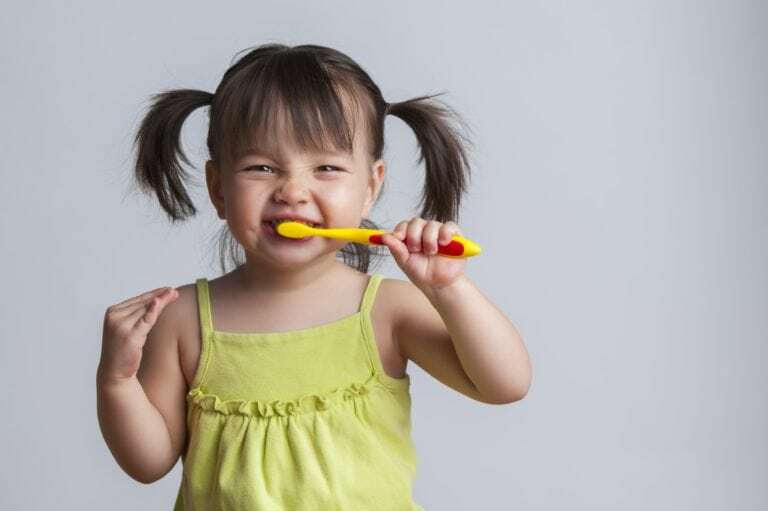 You want to avoid two main things when it comes to brushing your toddler’s teeth. First, you want to avoid using scare tactics as an attempt to force them to brush their teeth. These scare tactics will only make them fear the dentist and will convince them that brushing their teeth is anything but fun. Secondly, you will want to avoid making teeth brushing seem like a chore. Again, if they feel like they are being forced to brush their teeth, they are more likely to fight with you about doing it. There are a few different ways that you can perk up the act of teeth brushing and make it a more interesting activity that they will enjoy. For starters, to encourage your toddler to brush their own teeth, you will want to pick a toothbrush that has soft bristles and their favorite cartoon character. Brightly colored toothbrushes with cartoon characters look more like toys than the average toothbrush and it will help to get your toddler excited about brushing. Next, you may want to experiment with different flavors of toothpaste to find one that your child likes. No toothpaste is absolutely delicious, but if you can find a flavor that they prefer it will make them more likely to use the toothpaste. If they do not like the flavor and there are no other options, then this may make them resent toothbrushing. When it actually comes to the act of toothbrushing, you will want to find a way to make it fun. Some easy ways to do this are to play music, use a distraction, or brush your teeth together. Playing music is a good way to make tooth brushing fun, since most young children respond well to songs. It may be helpful to find a special song that you only play during teeth brushing that your toddler enjoys and responds well to. This will create a positive association with brushing their teeth. Another thing you can do is use a distraction to make teeth brushing easier. This one may require that you do most of the actual brushing, but if your toddler fights you, try finding a distraction for them to focus on. Maybe have them watch a short video clip or have someone play peekaboo with them while you quickly brush their teeth. One final thing you can do to encourage your toddler to brush their teeth is to make teeth brushing a family affair. Have everyone come brush their teeth at the same time, and make a daily routine of doing this at approximately the same time every night. Children respond well to routines and seeing that everyone brushes their teeth will reinforce the idea that this is a normal occurrence.